Ever saw movie called Lord Of The Rings? Ever read a book with same title, done by J.R.R. Tolkien? Ever watched the cartoon LOTR? I know, you must be asking yourself, what kind of question is this anyway… Hehe, at least you will have no problem recognizing these huge installments made in Australia. Man, if I didn’t know it was only a billboard, I’d be scared to walk these streets, I tell you… Please post the names of these creatures, since I don’t remember their species. Was it the Goblin, Troll, Gollum? Darth Wader…hmm… Jump inside this post for more pictures! Prev Fish Or a Girl ? Next What Does This Black & White Photo Show? Those are pretty cool. Any odea what they’re made of? Are they blow ups or cleverly painted billboards? I LOVE these. Where are they found? I wish I could get some of these, on a smaller scale, to place on my patio especially the first and third photo. They’re made by Weta Workshops in Wellington, New Zealand. Australian? That’s like saying Canada is part of the US. the first, fourth, fifth, and seventh are Nazgul, however, judging by the more vicious mount than what it common in the movies, only one Nazgul rides this, the Witch King of Angmar, and it seems that they are all the same. 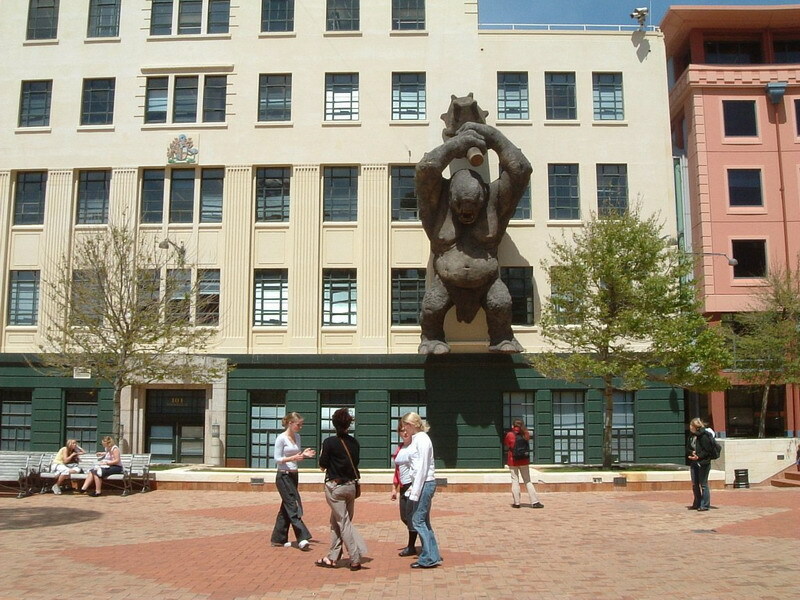 The three giant statues were created by Weta Workshop (Peter Jackson’s effects studio, headed by Oscar winner Richard Taylor). They were erected on top of the entrance of the Embassy Theatre in Wellington NEW ZEALAND for the premiere of each film. The giant cave troll was there for the first one, the ENORMOUS Gollum for the Two Towers, and the Nazgul for the Return of the King. Go to the satellite view then zoom right in. 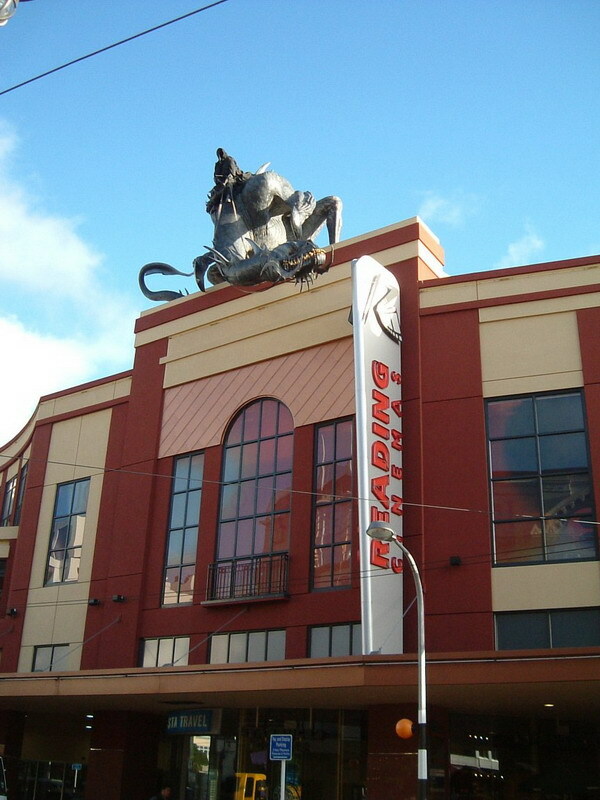 I’m sure I can see what seems like a giant statue on top of the theatre facing the street…? 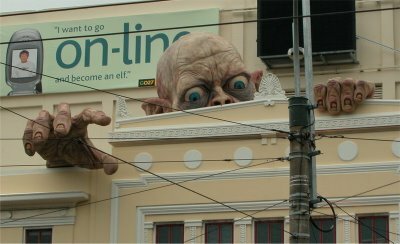 these are indeed made by weta digital in Wellington New Zealand. 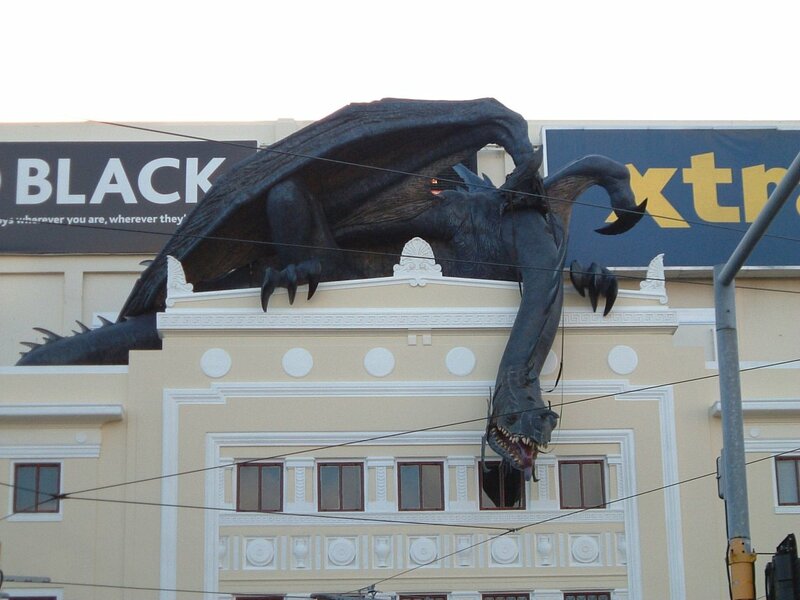 Weta Digital? Yes, the same guys that made all the stuff in the movies themselves… The statues are real statues and were put there for the premieres of the movies. 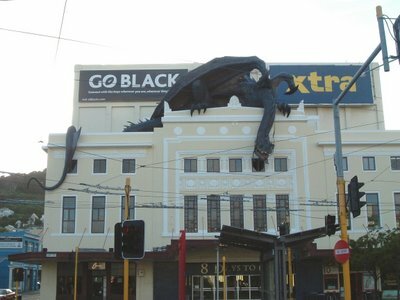 The guys at weta did more projects like these in NZ, like a giant tripod with camera (see website of Weta digital). I’m not sure what was used to create thos statues, but most probably it will be foam covered with plastic or latex or something. The Nazgul on Fellbeasts are actual 3D statues with a wood frame and chicken wire mesh covered with styrafoam, and then painted to look real. 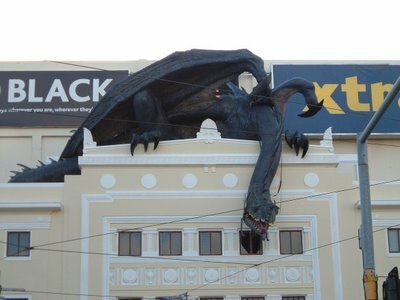 Then they simply attached them to the building and tada it is a “real” Nasgul on a Fellbeast looking hungrily down on the people lining the streets. 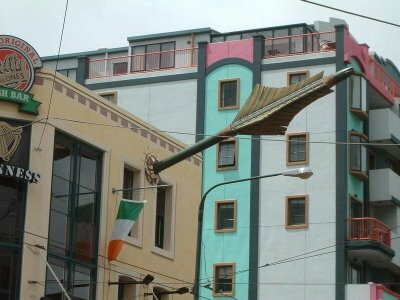 These were in New Zealand, i’m an Aussie but I was there when they had these up, I have photo’s of them on my computer. They were awesome! Our hotel was right near where they were so we’d walk out onto the street and see these huge Nazgul things and arrows. 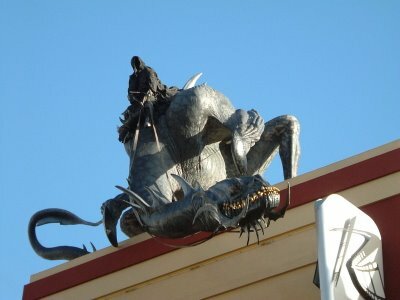 The dragon thing is a nazgual. The guy riding it, is actually the real Nazgual, but by the third movie they started to call him the Witch King, the “goblin” is actually Smeagul/Gollum, a hobbit who was morphed into evil by the power of the ring, also the troll is the mountain troll that attacked the Fellowship while they were in the old dwarf mines. Amazing. I love the books the movies and all of it. Congradulations, Anita. Always nice to find a fellow nerd. Why didn't they have Shelob anywhere?!!! Please get ONE THING right in your post. i love the giant nasgul, i feel lyk ridn on it dat if it is real. The first picture is of a ring wraith on a nazgul. The second is a troll holding a mace. The third is gollum and the sixth is one of Legolases arrows. The others i didn’t mention are all duplicates of the first! Yes I am a nerd and proud of it! You can tell most of these aren’t actually billboards, look at the shadow angle and shape. These statues outside of buildings aren’t illusions. Ok, first of all . . . I HATE Science Fiction movies. 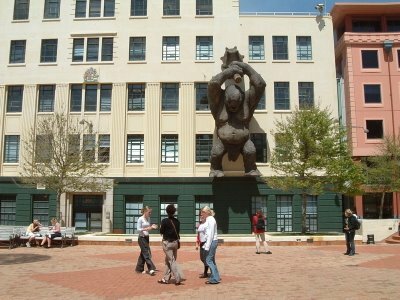 And secondly, the only statue I found interesting here was picture number three (3).